Once a year, for a few fleeting moments, there are round blocks of frozen octopus in my grocer’s seafood case. Although it’s not cheap, I grab a couple so I can make something with the rare chewy delight, full of character and charm. Often I make a sauce for linguine, where the critter bathes in tomato sauce and red wine, but this marinated appy keeps a few days in the fridge. It’s a rich, tangy and piquant blend based on the multi-seafood salad I used to make for my Italian Christmas Eve feast. Boiling time for the octopus is about an hour or more, depending on the size. This guy weighed about 3 1/4 lbs when raw and took an hour and a half of simmering with lots of water, a cork (I know, I know), some peppercorns, a bay leaf and a sprig of parsley. When it was done, drained and cooled, I boiled a pound of medium shrimp for about three minutes, drained and cooled that, and added the two items to diced red pepper, diced celery, chopped parsley, an optional pinch of red pepper flakes, a generous-sized finely chopped shallot and a couple fat cloves of minced garlic. 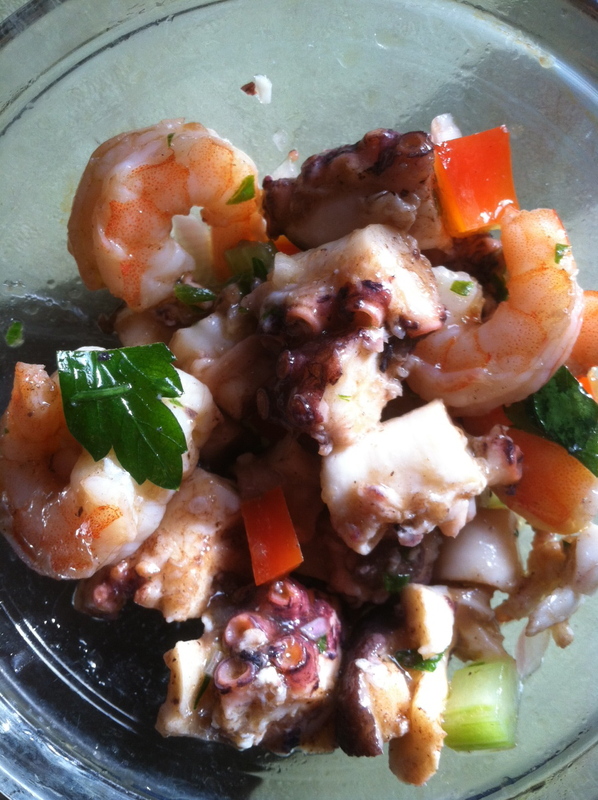 It also needed salt, freshly ground pepper, more extra virgin olive oil than would seem healthful, the juice of 1 and 1/2 lemons, and a generous glug of balsamic vinegar, not traditional but subtly flattering to both octopus and shrimp, I’ve discovered lately. This luscious stuff can be eaten right away, but a day or two of steeping, with an occasional toss, makes it even better.